Several bus lines serves Rome Ciampino Airport, entitled to Giovan Battista Pastine. Le fermate degli autobus si trovano davanti alle partenze internazionali. Below a complete list of bus lines, divided by destination. The following companies serve the daily connection by public transport between the airport and the Termini railway station. 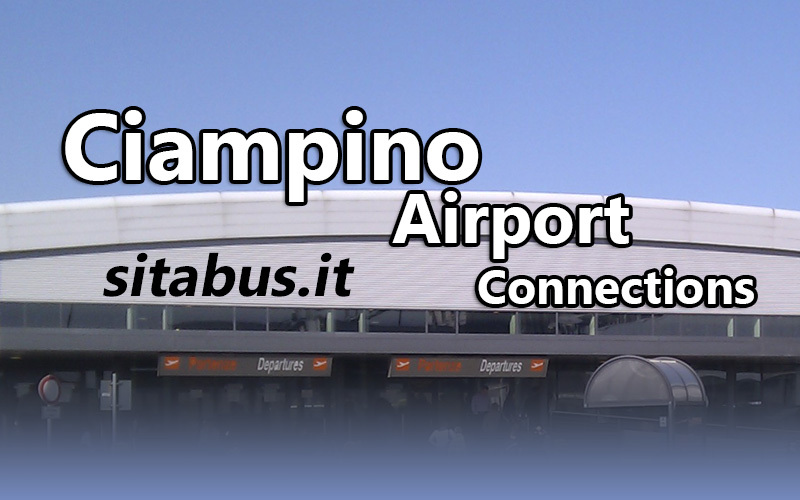 Atral bus line from/to Ciampino Airport takes about 40 minutes. Tickets: one way ticket costs € 4,50. Where to buy tickets: at the info box in the arrival hall of Ciampino, on board, at the authorized retailers and online. Sit Bus company has a daily direct line Ciampino Airport – Ciampino city – Roma Termini Station. It takes about 30-60 minutes (It depends on the route and the time slot). Tickets: one way ticket costs € 6.00 (8€ round trip) for Roma Termini – Ciampino Airport and € 4.00 (8€ round trip) for Ciampino Airport – Roma Termini.Where to buy tickets: at the info box in the arrival hall of Ciampino, on board, at the authorized retailers. Roma Termini Bus station is in Via Marsala. Terravision group offers a daily direct connection Rome Ciampino Airport – Rome Termini Station. It takes about 40 minutes and a frequency of 20 minutes. Tickets: online one way ticket costs € 4.00 e (8€ round trip); in other stores it costs 6€ (11€ round trip). Roma Termini Bus station is in Via Marsala 29 F/G. Schiaffini bus comany offers a daily direct connection, called Rome Airport Bus, with the Roma Ciampino Airport. Frequency is about 60 minutes. Tickets: one way ticket costs € 3,90. Where to buy tickets: at the info box in the arrival hall of Ciampino, at the info box in via Giolitti near Termini, on board, at the authorized retailers and online. Atral company offers a daily direct connection Ciampino Airport – Anagnina Station, from which you can reach many areas of Rome and province: from Anagnina you can take line A of Rome Metro and several Atac buses (to Rome) and Cotral (to Lazio). Line Airport – Anagnina takes about 20 minutes (indicatively Mon – Sun 06.00 – 22.30). Tickets: one way ticket costs €1,20. Where to buy tickets: at the info box in the arrival hall of Ciampino, on board, at the authorized retailers. Bus leaves Ciampino airport at Gate 02, Atral Departures. Bus leaves Anagnina Station at Cotral Departures. Atral has a line Ciampino Airport – Ciampino FS Station and it takes about 5 minutes. From Ciampino Station you can reach Roma Termini railway station (from Termini there is a train to Ciampino every 12 minutes and it costs € 1,50), Castelli Romani and the South of Lazio. From Ciampino Station there is also an Atral bus to the Hospital and the University of Tor Vergata. Tickets: one way ticket costs € 1,20. Where to buy tickets: at the info box in the arrival hall of Ciampino, on board, at the authorized retailers. RomaMarcheLinee connects several cities in Marche region and Rome (at TIBUS Station) and the two airport of Rome: Ciampino and Fiumicino. Tickets: price range 20€-35€. Where to buy tickets: at the authorized retailers and online. Start connects several cities in Marche region and Rome (at TIBUS Station) and the two airport of Rome: Ciampino and Fiumicino. Tickets: where to buy tickets: at the authorized retailers and online. PrimaLinee connects several cities in Marche region and Rome (at TIBUS Station) and the two airport of Rome: Ciampino and Fiumicino. It has a line Agropoli-Roma and connects Campania region and the Ciampino Airport and Fiumicino Airport.